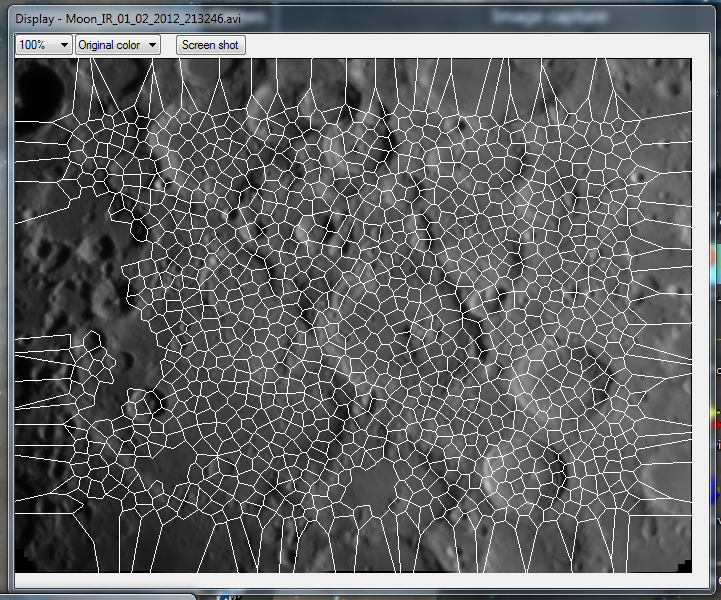 This is a freeware stacking program comparable to for example Registax. 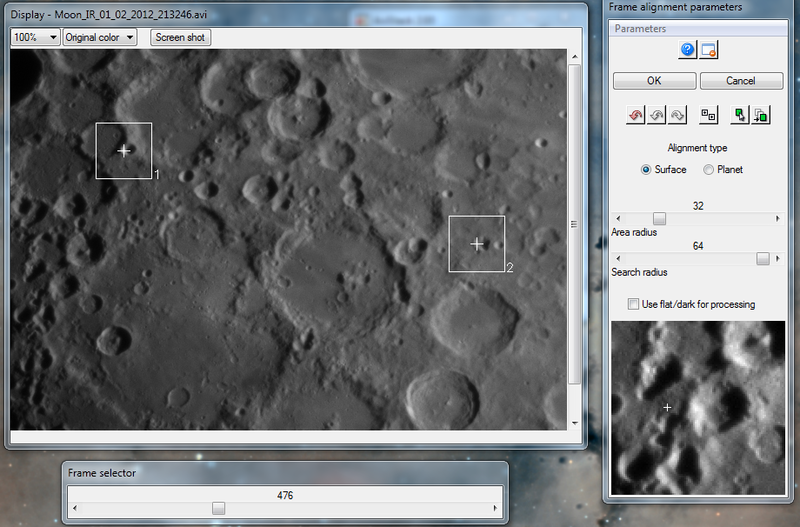 In my experience Registar is better in planetary processing, while avistack is better for lunar and solar processing. First we start with stacking the movies. Therefore we will use avistack. With green I will mark the settings that are changed from the standard settings. In yellow you will see when you go to the next step. Basically you can go along the green and yellow steps to go through the processing fast. I will describe every step to give a feeling of what is happening. In the right screen choose for and open the movie you want to process. The left screen shows the processing steps and the according settings. 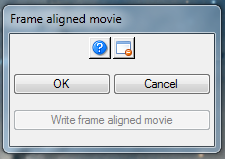 The center frame shows the movie, the right screen shows the settings for this processing step. By selecting the quality analysis checkmark you can let the program automatically select the best images using sharpness and brightness. 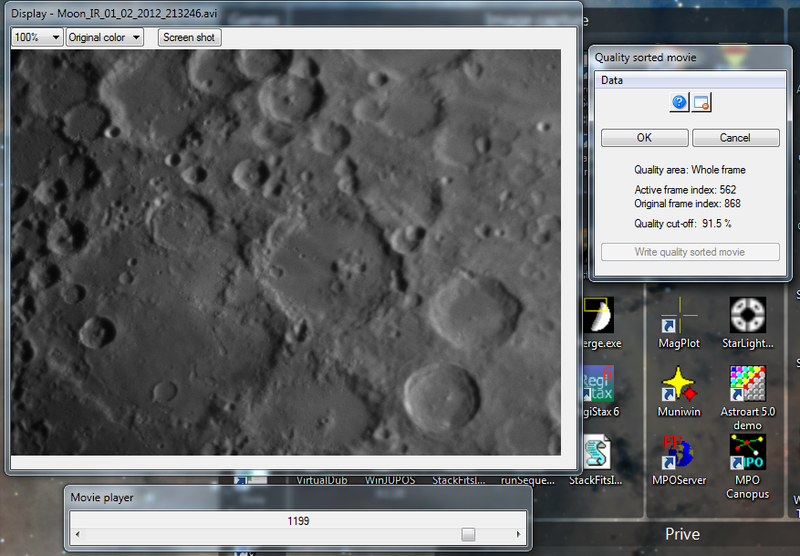 With the quality cut-off you can set the percentage of the best images used in the processing. When seeing is good, and you have an overall good recording you can put a high percentage here (like 80% or so). When seeing is bad, or you have only a few good images in the movie, then select a lower percentage (20-30%). Remember the more images used, the lower the noise. 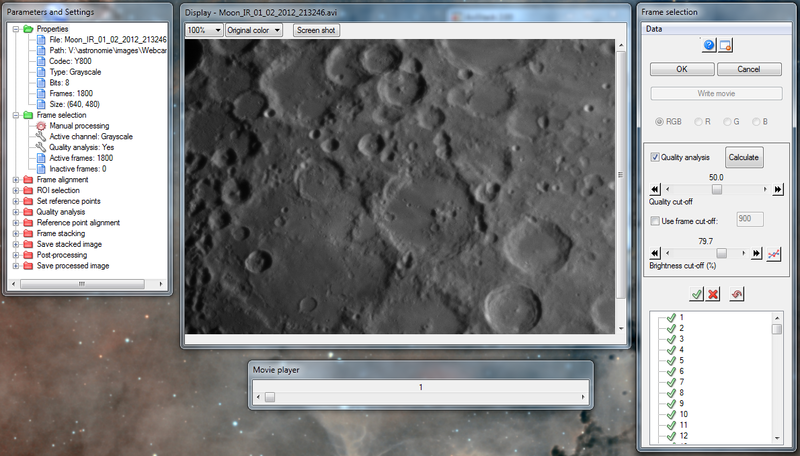 You can also use a frame cut-off to manually select the amount of images used. 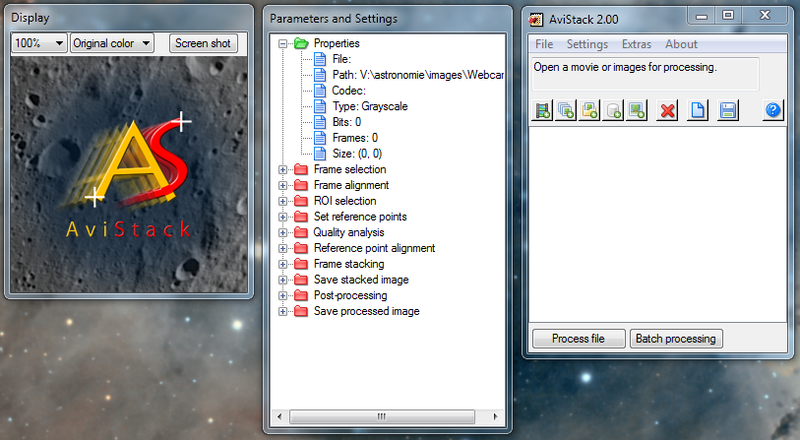 Next press calculate to have avistack calculate which images are selected. 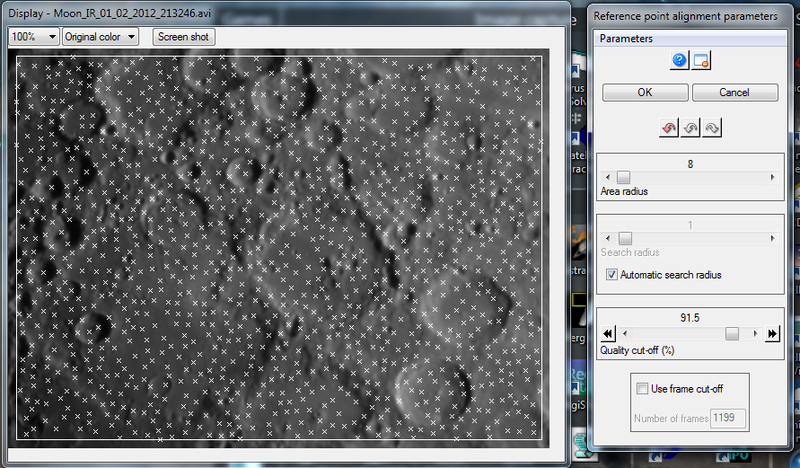 After finishing the calculation the button will change to apply and by pressing this you will select the images. If you want to manually add or delete images from the processing this can be done in the bottom half of the box with the green checkmark/red cross. Next press OK to go to the next step. The squares show the chosen alignments points. AviStack will place them automatically in the first frame. 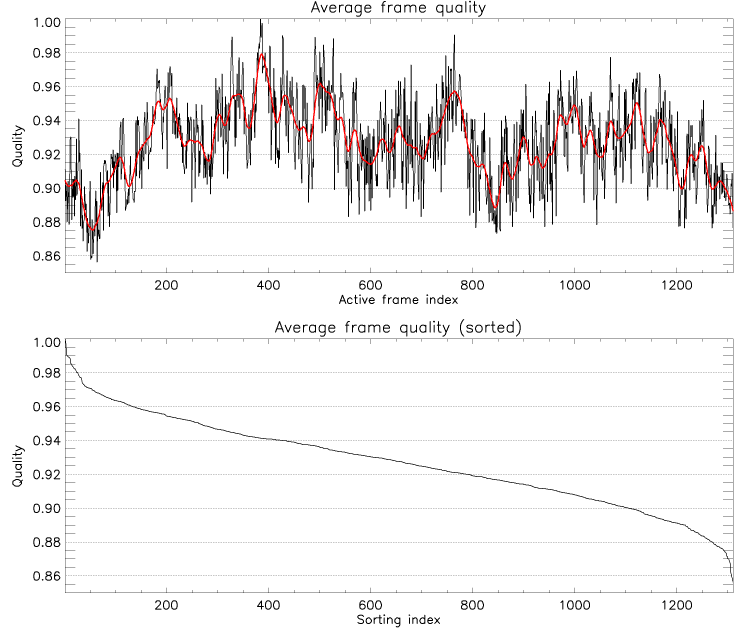 If this frame is not suitable (too low quality) you can simply choose a different Frame using the frame selector. The two alignment points are used to determine the drift of the field of view and the seeing conditions. By pressing the left mouse you can set point 1, by using the right mouse button you set point 2. Press OK to go to the next step. This screen shows the results of the analysis. The upper part shows the deviation between the two pixels in all the images. This should be low when seeing is good. With the mouse you can drag a square box in the upper screen. This box determines which images you will NOT use in processing. 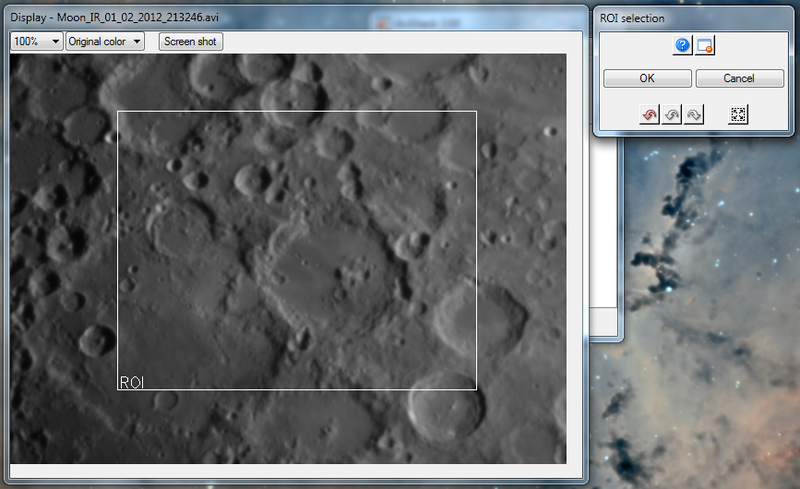 The right box shows the active frames that are left that will be used in processing (in this example 130 images are not used). I normally try to select all images until about 2 pixels deviation or lower. You can see the aligned movie now, and with the frame selector you can see through it to see if it aligned properly (the images should not move anymore between frames). In this screen you can select with your mouse a region that you want to process (if you want to only process a smaller part of the image). With the right mouse you can move the rectangle. Doing nothing here just process the whole image. The program will select reference points as shown. 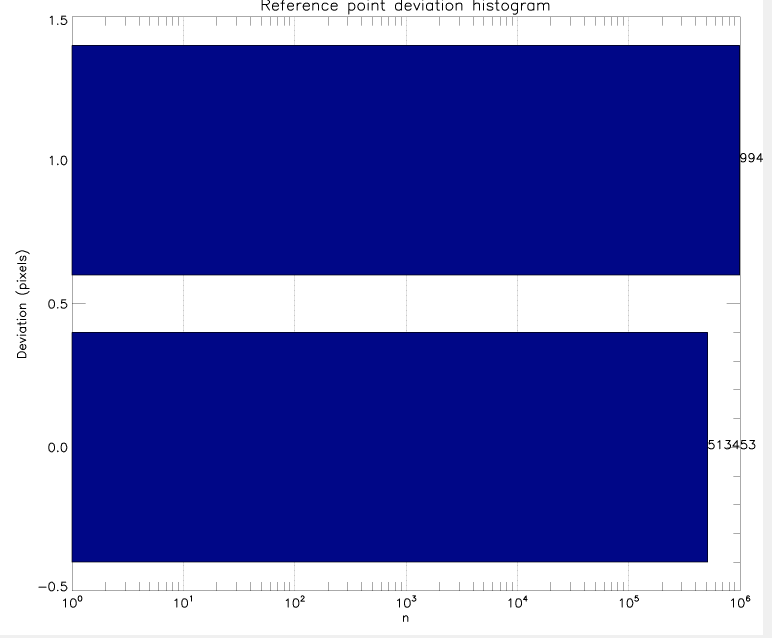 With minimum distance you can change the amount of generated points. As the image quality varies within a frame due to seeing related distortions, the quality is calculated for small areas of the image, separately. That way only the best parts of an image are later used, even if it is only one small area of a whole frame. The size of these areas is determined by the Quality area size (I use 32). I use standard quality analysis here. For Noise reduction I use setting 1. Next you will see an informational view where you can see the seeing during the recording. Now you will see a quality sorted movie. You can use the movie player to scroll through the sorted movie. In this way you can look when the quality starts to degrade. 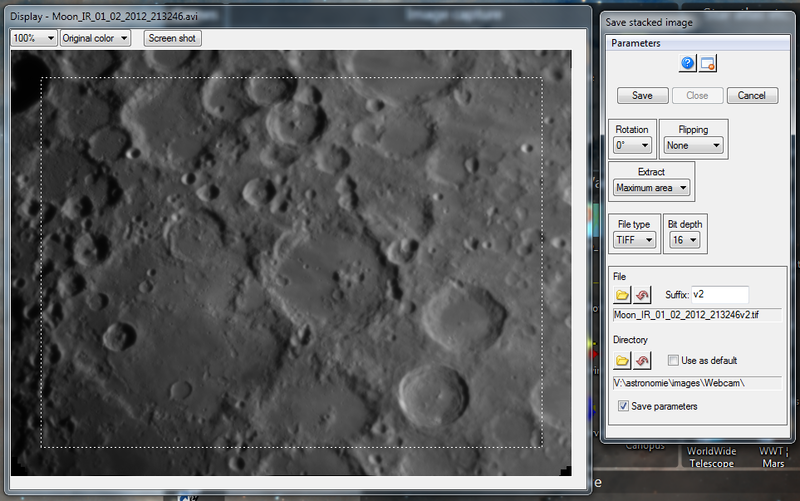 In the right pane you can then see which cut-off should be used to use only the images until this point. Remember the number (in this example it’s 91,5%). In this screen set the quality cut-off to the value of the previous screen. For the rest use the shown values. Press OK to go to the next step. 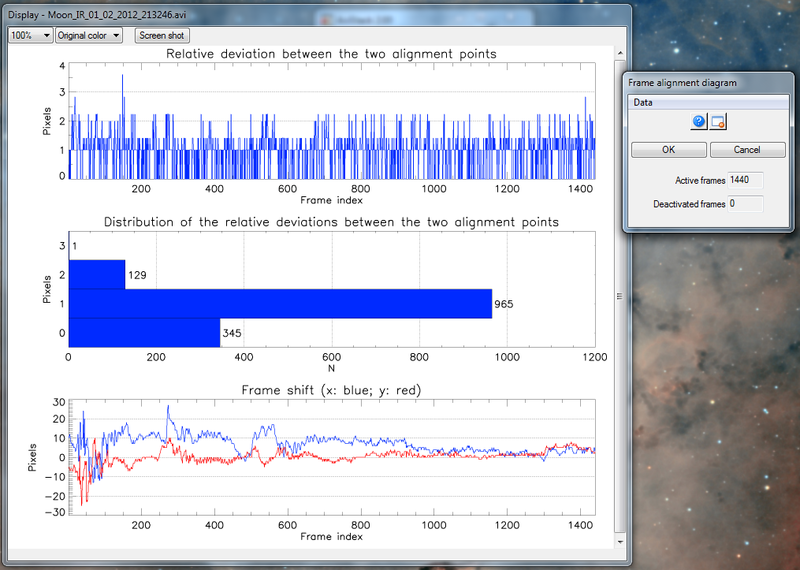 Now you get another informational screen with the distribution of the deviations. Now you will get into the frame stacking mode. Just press OK to start the stacking. After stacking you will see the next screen. 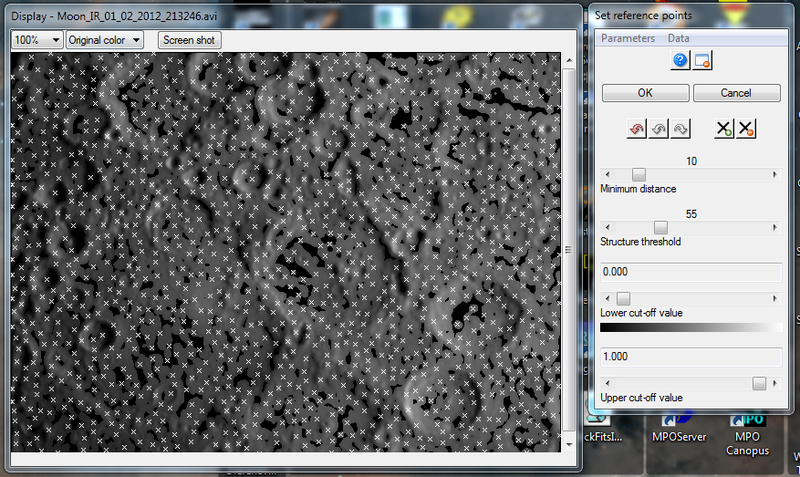 Set the extract to maximum area and file type to 16-bit tiff. Select save and save your file. Now you can close the screen and press cancel in the next step. We’re done now with avistack.